Media reports indicated Trump chose him. It’s unclear if he accepted. Likely so as otherwise consideration of him for the position would have been kept under wraps. We’ll know either way soon. The Assistant to the President for National Security Affairs (NSA) needs no Senate confirmation. Duties involve advising the president on national security issues – specifically domestic, foreign, and military policies, along with assuring cooperation between military branches and civilian intelligence agencies. The 1947 National Security Act established the National Security Council, the NSA its head, the legislation also creating the CIA, America’s first peacetime intelligence agency, succeeding the wartime OSS, dissolved in 1945.. He called the CIA the president’s praetorian guard, a private army operating extrajudicially, unaccountable to Congress or the public, menacing fundamental freedoms. Last March, he lied, claiming “Brussels is their battlefield. Paris is their battlefield. San Bernardino is their battlefield” – all false flags, along with similar incidents in America and Europe, innocent patsies blamed for state-sponsored crimes. 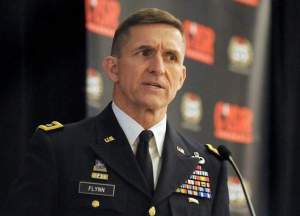 “I’ve been at war with Islam” for decades, said Flynn, adding “fear of Muslims is rational.” Post-9/11, he was involved in torture and other disturbing practices. Appointing him NSA, if he accepts, isn’t an encouraging sign, suggesting Trump’s administration intends continued war on Islam – instead of ending what never should have begun.